I am back with another beautiful table, this time for Easter! 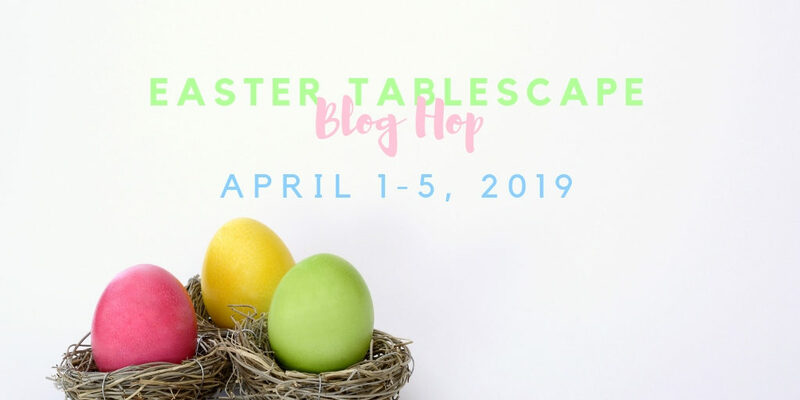 This week twenty two fantastic table stylist bloggers will be sharing their vision of an Easter tablescape. I hope you will take the time to visit all of their blogs. Whenever I am going to style a new table, I look for something unique to do. 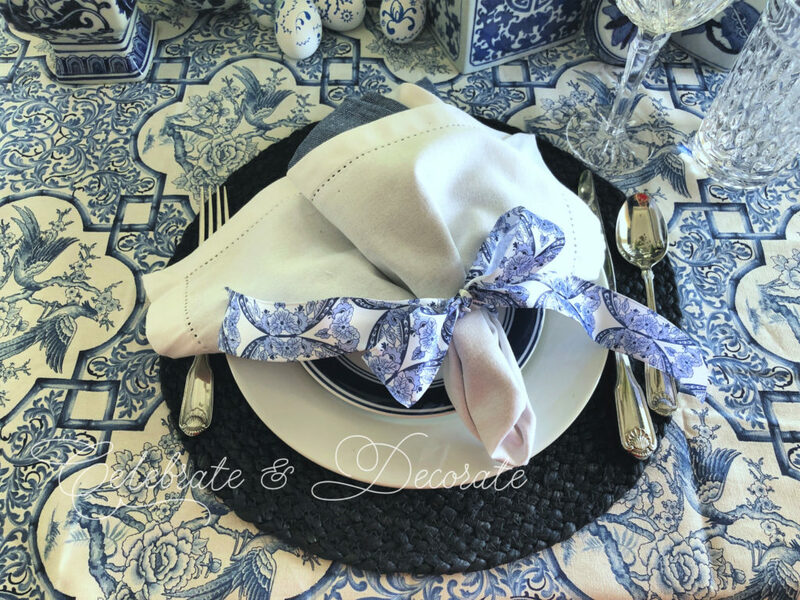 I have styled a table using some of my porcelain pieces for a Blue and White Chinoiserie Inspired Tablescape. When I went back to add this link to this post did I realize I had used the exact same stemware. Ribbon tied napkins were not what I wanted to do again, but when I spotted this ribbon, there was no question what I was going to do with it! Layered napkins of white over blue were set on the simple plates. Using two different techniques, I decorated eggs to add to my table. Some of the eggs were decorated with sharpies and some were decoupaged with paper napkins. A Ralph Lauren tablecloth was selected for the foundation for my table with round navy blue placemats distinguishing each place setting. Some of those gorgeous porcelains are from Ballard Designs. I know I will continue to add to my collection. The navy blue walls of my dining room are the perfect backdrop for this table. White dinner plates were topped with simple blue and white diner style plates. 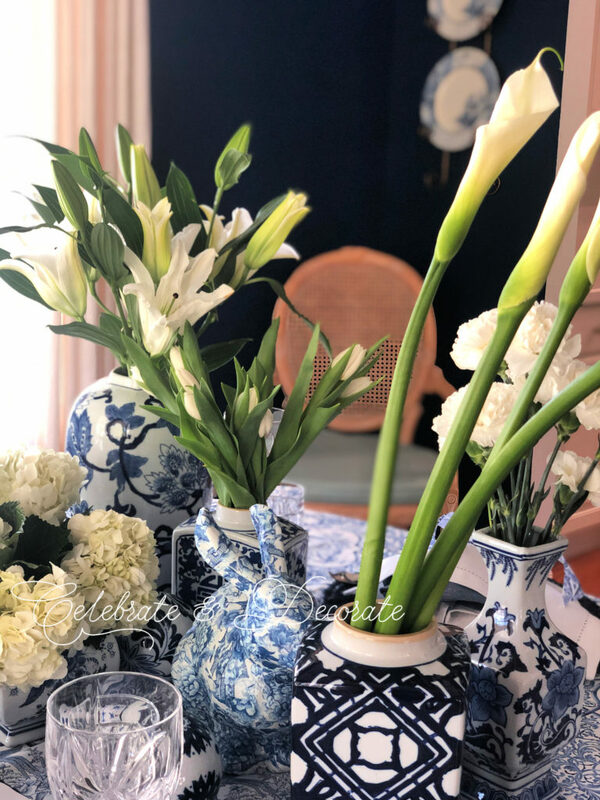 Upon beginning to style this table, I considered using all one color of flowers, perhaps yellow, but I decided to keep it all white and blue with a variety of white blooms. White calla lilies, white asian lilies, white tulips, hydrangeas and carnations, each in their own vase are gathered around a decoupaged bunny. My everyday flatware was fine for this table. This is the Classic Shell pattern from Oneida. Take some time to visit all of the following blogs and see all the beautiful tables these talented ladies have created! Thank you so much Mary. I appreciate your sweet complements and kind words. Thank you for sharing your talents in these ongoing blog hops! This is so pretty. Love the chinoiserie. The white floral arrangements look fabulous and I like the cluster of eggs and bunny! Thanks so much Liz! I toyed with the idea of all yellow blooms, but I thought the all blue and white was a simpler look. Oh thank you so much Ann. I am touched that this took you back to that early memory. Thanks for joining in another hop! Just lovely, Chloe! I love all your blue and white pieces. Chloe, I am a big fan of blue and white for any season! Your chinoiserie table is beautiful. The RL cloth is the perfect foundation for your lovely vases of callas, hydrangeas, and lilies. Also, the eggs are so pretty and unique. Thank you for organizing the hops, they are always fun. Happy Easter! This is so pretty Chloe and such a wonderful unique way to create an Easter tablescape! 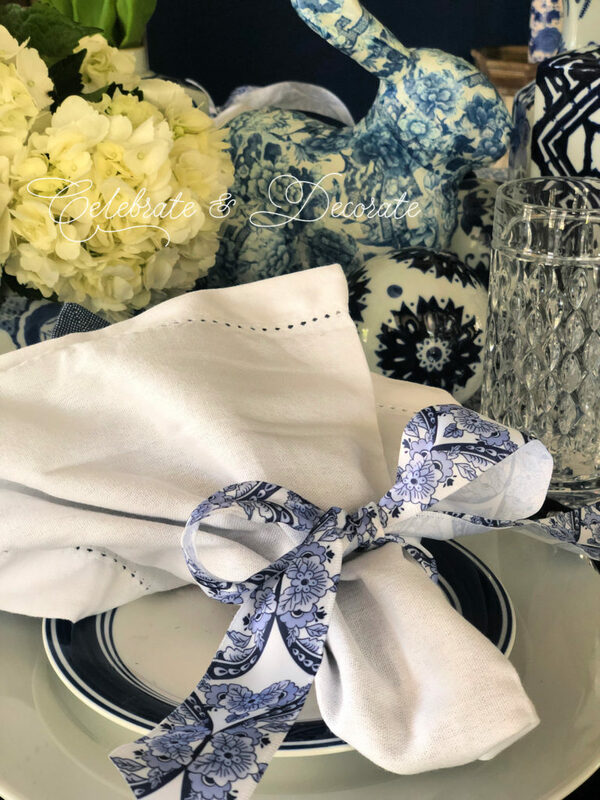 The blue and white pieces are elegant yet welcoming, and I love the ribbon tied napkins and the mix of patterns everywhere. Your crafty eggs look fabulous and did you decoupage the bunny too? Very stunning!! Thank you once again for all you do for these blog hops, you really keep us on our toes and I swear each hop is more incredible than the last! Thank you for ever inspiring! I absolutely love chinoiserie and this is breathtakingly beautiful, Chloe! 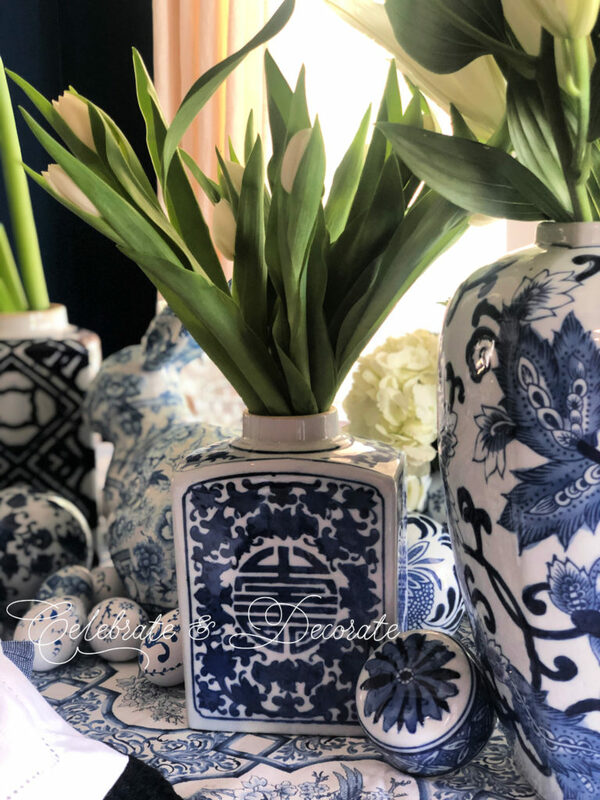 Love chinoiserie and blue and white! Your tablescape is delightful and creative. 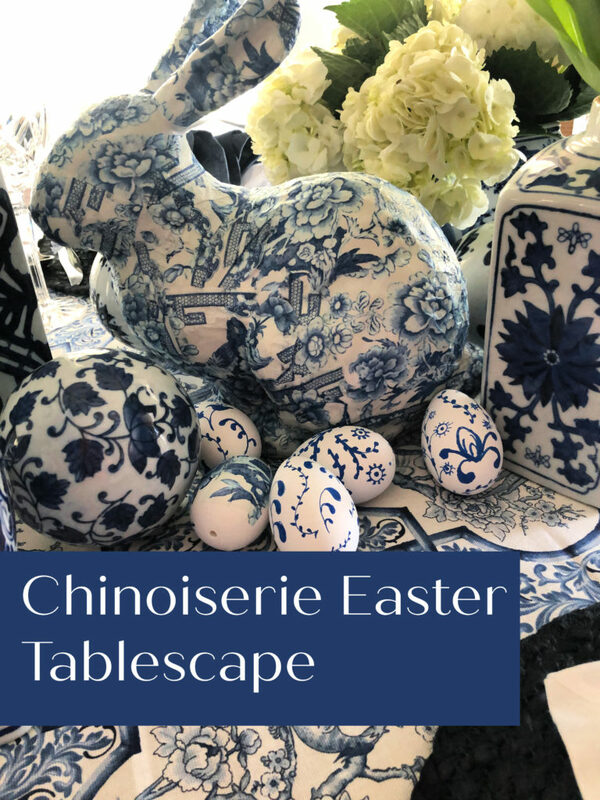 I adore the chinoiserie bunny and eggs and your tablecloth! Your centerpiece is beautiful with all white flowers and various heights and shapes of blue and white urns and vases. Your choice of flowers was perfect. A round table is great for this look. Chloe, thank you for organizing the blog hops and keeping us going. We appreciate your time and work. Chloe! Chloe! Chloe! 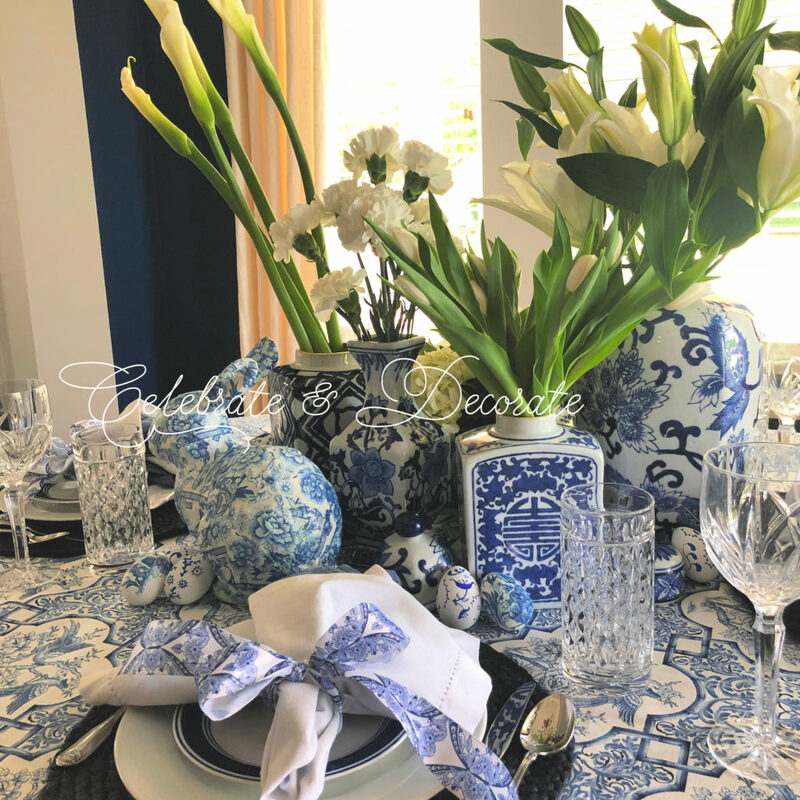 Just when I am in love with the color pink, you come along with this stunning tablescape of blue and white chinoiserie! !!!!! What were you thinking using the hand painted blue on white eggs? 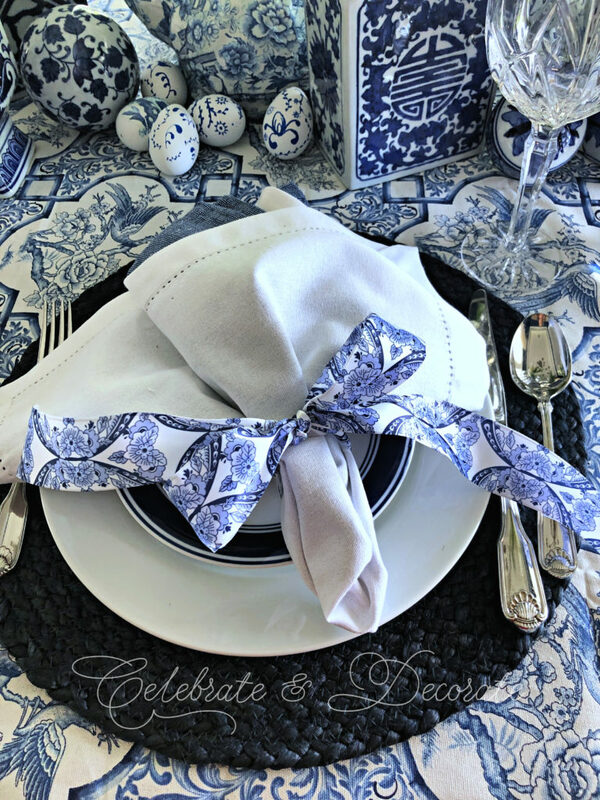 And really…using beautiful blue and white ribbon to tie up a napkin???? So adorable and original, but come on, you are outshining the best of tables. The bunny. Can we talk about the bunny? How stinkin’ cute is he? Did you really take the time to decoupage him???? Come on fess up now. And the Ralph Lauren tablecloth could not be a more perfect backdrop for your blue and white pieces. I personally know how busy you are and even though you have more free time now that your little cuties are with their Momma…you can’t possibly have designed this gorgeous table by yourself. Organizing a blog hop is not easy…. and working on our collaborative efforts for Celebrate Your Story takes time…coming up with inspirational wreaths and door swags are mind boggling…. so come on, What professional interior designer/stylist set up this table in your lovely navy blue dining room? Oh Kari, you make me smile! Yes, I did style my table and I painted the eggs and decoupaged the rabbit. Did I fail to mention in the post that my bunny had a broken ear and by decoupaging him, I was able to cover up the crack. Now, if I could only decide on a better color of paint for the rest of home! It is blue, but I went so light that it photographs white! Thanks for your friendship dear friend! Will I see you at Haven again this year? I hope so!! Oh my, Sandra, if you were my agent, I would be featured in magazines and on TV! I don’t know how I keep coming up with different ideas for tables, but note, there are no new dishes on this table! I just got back from a fabulous week long cruise, I am rested dear friend! Ab-so-lute-ly STUNNING Chloe! I adore it all. All the chinoiserie patterns layered one on top of the other against the navy walls makes it appear just like a magazine photo shoot. I’d love to have blue and white chinoiserie plates and decor pieces…but alas, no more room at my inn. Thank you so much Debbee! Just yesterday I spotted some lovely chinoiserie dinner plates at Home Goods. I resisted! I need to get my dish pantry in order before I indulge. Notice I used plain white plates and simple blue and white diner style salad plates. Thank you so much for hopping along with us! Chloe, your table is stunning! I love the blue and white…it is so elegant. I think your choice of all white flowers was spot on. Any other color would have taken the eye away from the other details… especially, the gorgeous flatware and stemware! Hugs! Thank you so much Benita! Even I can not look at my photos and imagine how I thought yellow blooms would have been a better choice! Thanks for hopping with us! Wow Chloe, love Your chinoiserie. This table is gorgeous and so creative. 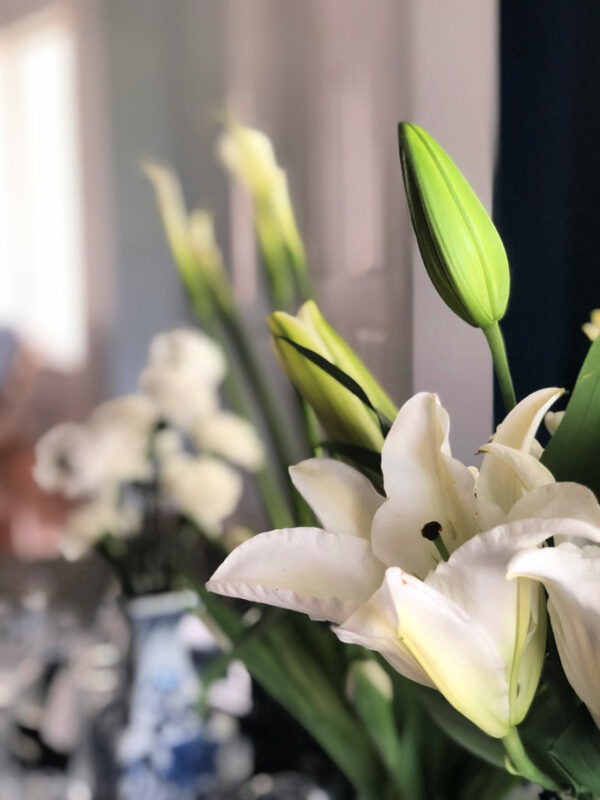 White calla lilies, white asian lilies, white tulips, hydrangeas and carnations, are timeless. Such a stunning table to sit down and enjoy being pampered. Thank you again for organizing a lovely Easter blog hop. Thank you so much Linda. I have really been focusing on colors in my tablescapes lately, keeping them monochromatic or in just two colors, I guess I am in a color rut! Thanks for joining in another hop! Chloe….so beautifully done. There is something elegant and yet, intriguing about bright blue and white chinoiserie. A wonderful symbol of sophistication and worldly style. Love the mix of patterns, especially the Ralph Lauren tablecloth. The white flowers and beautiful crystal really speaks distinction and grandeur. So very lovely. Thank you Chloe for all that you do and have a wonderful Easter holiday. Thank you so much Marsha! My table did turn out much more formal than some of my Easter tables in the past. Chloe I am crushing on blue and chinoserie so I am definitely going to be pinning away your beautiful ideas! I love this unexpected color choice which is still so perfect for spring, reminiscent of pretty blue skies and blue birds singing their spring songs. Just lovely! Thanks for hosting this fun hop! Thank you so much Amber! I don’t know what made me go this direction for Easter, but I was happy with how it turned out. Hi Chloe, I’m a sucker for blue and white—only reason I waded through 19 ads—for shoes, walking, mattresses, stomach issues, tatoos>>>>??? ?, dunkin donuts, flashing ads, video ads and and ads that crossed your content. As I write this, 7 ads have flashed to the right of the screen. This is sad. Disney cruise ads. There should only be one ad on the side, but it changes the longer you are on the page. Ads are the only way I can make the money I need to pay for my blog hosting and supplies for crafts and fresh flowers for tablescapes. I am sorry you were so disappointed with your experience. 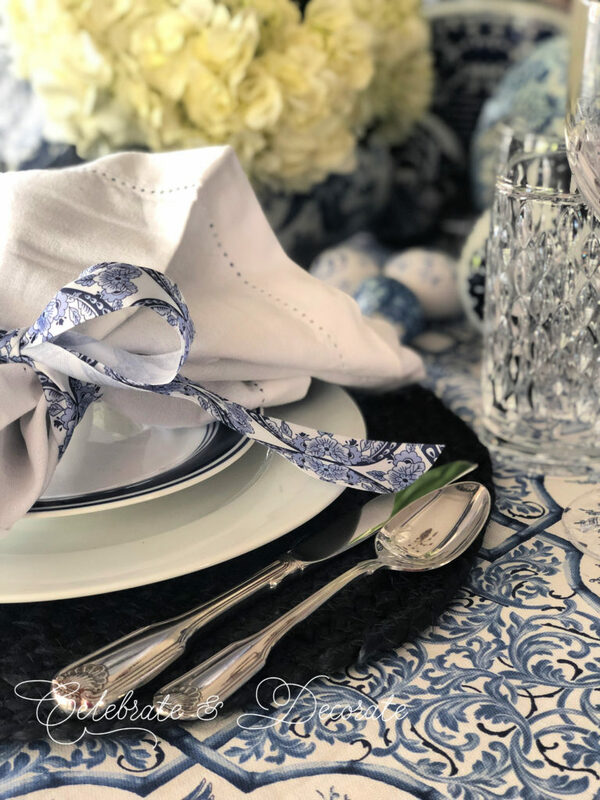 Chloe, your blue and white Easter table is gorgeous ~ so classic and yet so modern. Chinoiserie has been around for centuries and is making a big comeback. The blue tablecloth and blue placemats are perfect. I can’t believe you made all the Easter eggs to match. They just make the whole tablescape more special. I love every detail about this tablescape. Thank you again Chloe for organizing our tablescape blog hops and giving us bloggers the opportunity to provide our readers with ideas and inspiration. Thank you so much, Carol. I felt like I had to have some eggs and a bunny on the table to make it an Easter table! Another stunning tablescape Chloe ! 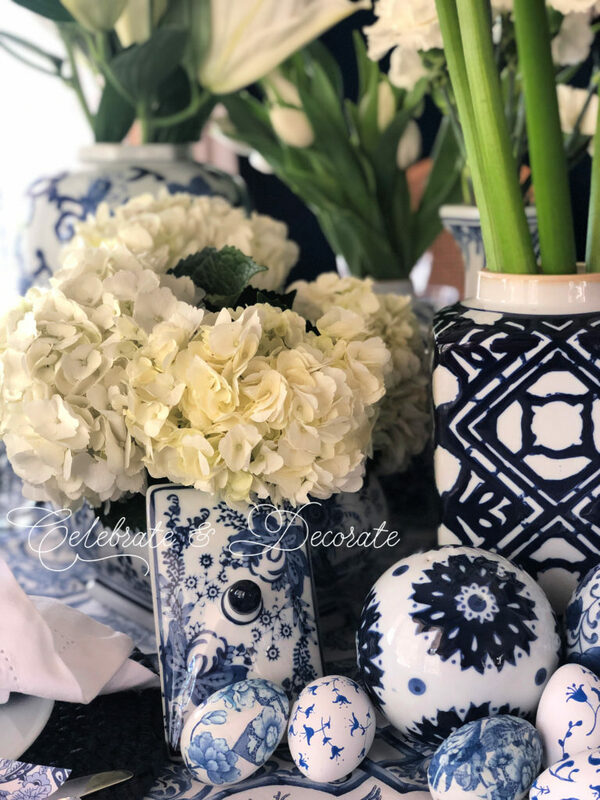 I’m a fan of blue and white and use it a lot with china and Oriental jars and other pieces; so this is very inspiring for me. 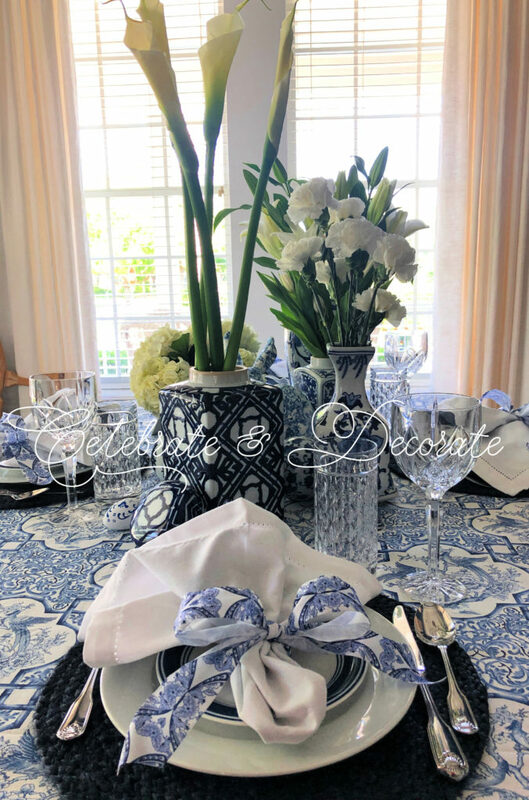 Your gorgeous setting with the jars, tablecloth, and the bow wrapped around the napkin in the same material is fabulous … and it’s actually what caught my eye ! Thank you so much Fabby! With my blue walls, blue and white are a natural in my dining room! Thank you for takimg the time to stop by and comment!! oh my goodness it is a stunning table, my friend. Absolutely gorgeous in every way. The bunny and the ginger jars are some of my favorite things. Thank you, Chloe, for including me in this beautiful tablescape tour. tT means more than you realize. Biggest Hugs! Thank you so much Katherine, I am happy to have you be among my tablescaping tribe! The jars are actually a love of my husband’s but they look great on my dining table with my navy blue walls! Thank you so much Maryjo! I don’t know why the blue and white called to me this year, but it really kind of created itself. The white blooms really remind me of the fresh start we all begin with our Easter celebration. I love this so much friend! It’s absolutely beautiful! The blue and white eggs are PERFECTION! Oh my, thank you KariAnne. I do love to style a pretty table. Even more, I like to have family and friends sit at that table and I love to lead a prayer thanking God for all of our blessings. There is no more important time of year than this holiday when we thank God for his greatest sacrifice for us. Beautiful tablescape. The blue and white is so classic. Thank you for sharing at Happiness is Homemade Link Party. Oh Chloe! I LOVE your table. Blue and white is such a classic and timeless color combination. I usually shy away from mixing patterns, but you nailed this with all of the gorgeous chinoiserie motifs. I love the ribbon tied in a bow on the linen napkins. I’m a huge fan of restaurant china, so I’m crushing on your blue rimmed diner style plates. 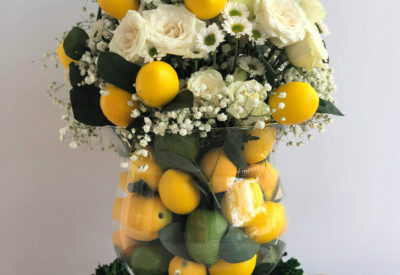 I love how you chose several types of fresh white florals. And the decoupaged eggs and bunny are the perfect Easter touch! Thanks again for putting these hops together. I’m looking forward to meeting you at Haven! Have a very Happy Easter! Thank you so much Rebecca! Yes, my plates are simple restaurant brands. I am so glad to learn you are coming to Haven! I look forward to meeting you, too! It is so wonderful to create that human connection instead of just the electronic one! Chloe, your tablescapes are always gorgeous but this is my favourite ever! 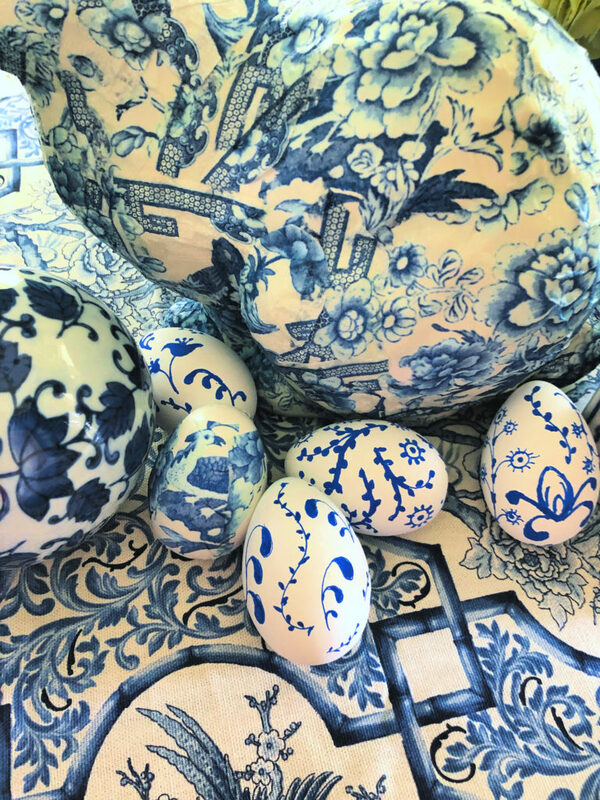 Love every single detail: decoupage bunny, decorated eggs and blue & white napkin ribbons are absolutely perfect! Wow! Chloe, this is such a beautiful and inspiring table! The blue and white color scheme is so elegant and your mixture of patterns is perfect. I love your ribbon tied napkins. The decoupaged eggs and bunny are just lovely! Thank you so much for hosting this wonderful blog hop! Wishing you and your family a very happy Easter! Chloe, I love, love, love this table! You know how I adore blue and white so this just speaks to me. Every detail is just gorgeous! Thanks so much for hosting another fun blog hop. I hope that you have a most blessed and happy Easter!! !